The trial of Linden Lestrade of Canefield who is charged with unlawfully and maliciously shooting Greg Joseph of Roseau with intent to do grievous bodily harm at Castle Comfort, Roseau in the early hours of Saturday October 3, 2009 is expected to go into its sixth day today Monday March 17, 2014. 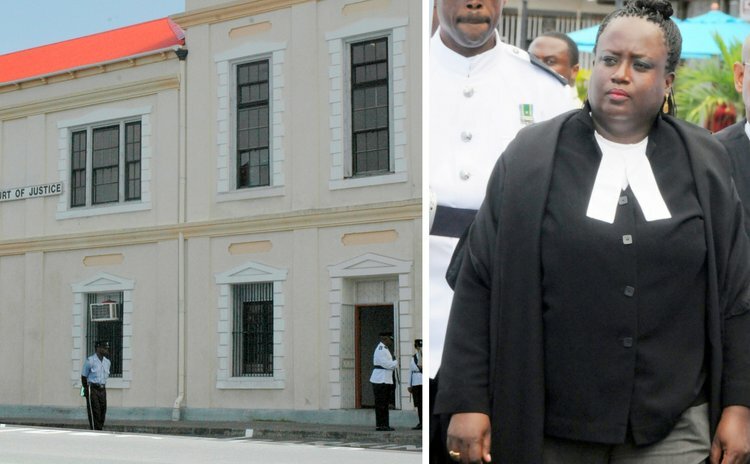 State Attorneys Sherma Dalrymple and Arthlyn Nesty has called five of the 15 witnesses before Justice Birnie Stephenson and a jury of four men and five women by the time The SUN was preparing to go to press. Lawyer Zena Dyer led the defence with the assistance of lawyers Michael Bruney and Gina Munro. According to the evidence presented in court, Jamilla Joseph and her boyfriend Greg Joseph had gone to Krazy Kokonuts about 1:30am that Friday morning. On arrival outside Krazy Kokonuts in the car of Greg Joseph, Jamilla telephoned Naja Anselm who was inside the night club. Greg parked his vehicle in the vicinity of the McMillan Service Station. Naja came out to Jamilla and Greg and they went into the entertainment club. The Triple Kay band was playing. Jamilla and Greg began to dance. Hardley Joseph whose relationship with Jamilla had been ended before that shooting incident came into the club. He spoke with a band member, "turned and looked in my direction and started walking towards me," said Jamilla Joseph. "He came in front of me, said something to me and slapped me across my face. I went to the side. Both Hardley and Greg were standing close to me. A little while after Linden Lestrade came and asked, what was happening? I told him that Hardley had just slapped me. Linden took me out of the dancing area into the yard. He grabbed my hand. Hardley started making a fuss so he left and went to check on Hardley. "My friend Naja Anselm came and spoke to me. Hardley was at the side of the bar being held by police and others. Greg was there looking. Greg and I decided to leave the Krazy Kokonuts. I started walking towards Greg's Corolla. Hardley started running towards me, grabbed me and we both fell to the ground. He started punching me, slapping me and choking me. I got a cut on my eyes and my prescription glasses got broken. I tried to free myself from him. I was not successful… I could feel someone trying to pull me. I suddenly heard a loud explosion, and all of a sudden Hardley just let me go. I turned and saw Greg lying on the ground. He was on his back. I saw blood was coming from the left side of his face, and I started crying and calling out to him. He did not respond. All I could see was his eyes moving from side to side. Someone came and placed something like a cap where the blood was. A van came after a while and Greg was placed on the van, and the van left. I walked back to meet my friend Naja. I called another friend of mine. She came with her boyfriend and took me to the hospital on a bus, the Princess Margaret Hospital. I was taken to a room where Greg was lying on a bed. I spoke to him, he did not respond, but he just kept moving his eyes." Ian Bowers of Pointe Michel was dancing with Naja at Krazy Kokonuts when Naja answered a call on her phone. Naja left him, went out and came back with Greg and Jamilla. "While we were on the dance floor," said Bowers, "I saw a guy come and he jacked Jamilla. She fell back on Greg and me. Some guys came, held the guy with the red shirt – the guy that jacked Jamilla – and took him outside. I got to know his name was Hardley or something like that. We followed – Greg, Jamilla, Naja and myself – close to the door. I saw the guy wrestling with those guys who were trying him to take him out. A policeman came and intervened. He started getting on with the police, and telling him, f…ing let him go… Then Linden came, spoke to the police. The police let go the guy with Linden. The guy started to get on with Linden…" Ian Bowers and his three companions started to walk towards the exit of Krazy Kokonuts. Bowers said Naja and himself stayed inside the premises while Greg and Jamilla went outside… The police came back with the guy with the red shirt and put him out of Krazy Kokonuts compound. "Naja said something to me and we left the compound as well. When I was out towards the main road I saw the guy with the red shirt running towards McMillan Gas Station. I followed him. I met him by the McMillan Gas Station. Jamilla was there. He grabbed Jamilla and they started wrestling and fell to the ground. He was grabbing Jamilla and Jamilla was trying to get him off her. He had her in a choke hold, like a head lock. I went trying to take his hand from her neck, and Greg was trying to pull her off. Somebody came and pulled Greg. "One guy came with a van. They put Greg on the van and they brought Greg to the hospital. Myself, Jamilla and Naja got a ride and went to the hospital as well." Also giving evidence were Dr Garvin Seaman who was on duty at 4:00am when Greg was brought in and Dr Irving, ENT Specialist and head and heart surgeon. Dr Seaman noted that the patient had a 2-centimetre wound to the left side of his face near the angle of his jaw. The wound was oozing blood. The patient also had bleeding from the left ear and arm. There was soft diffused tissue swelling at the back of the head. On reviewing an x-ray of the skull, Dr Seaman noted highly radio opaque densities to the back of the head. The densities had the appearance of metal fragments consistent with injuries from a gunshot. Dr Pascal saw Greg Joseph about 7:13am on Saturday October 3 and again on November 23, 2009. Greg complained of pain to the left region of left jaw and neck. The wound was two centimetres, and there was tenderness and swelling of the left occipital regions. On second examination after Greg returned from treatment in Martinique, he complained of decreased hearing of his left ear, headaches and giddiness. There was still diffused swelling of the left area of jaw, and some paralysis of facial muscles. The other witness was Corporal Lindon Timothy who headed the police security at Krazy Kokonuts that night.